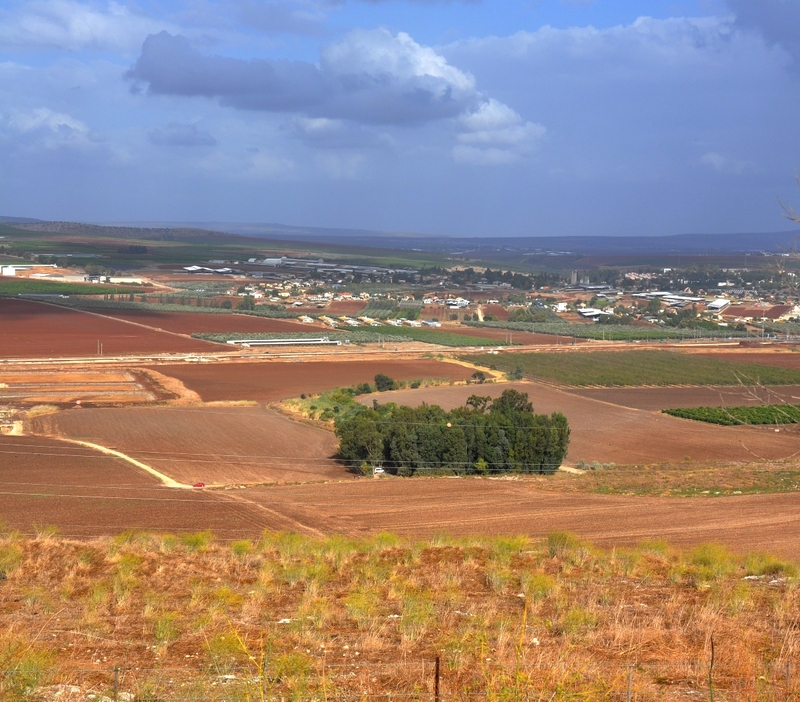 The horizontal cluster of white buildings in the upper center of photo mark the spot of ancient Shunem, the site of the Philistine encampment referenced in our text. Shunem, note white buildings upper center. Photo by Leon Mauldin. 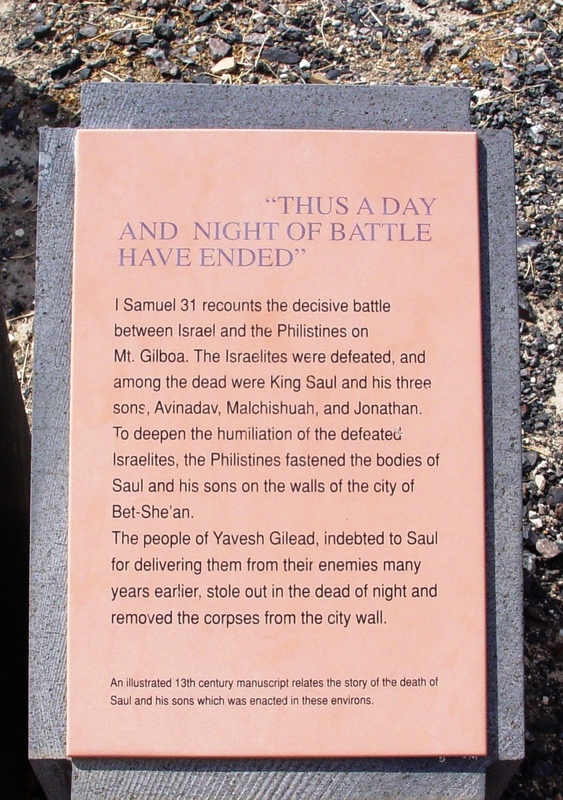 Saul and the forces of Israel were encamped at Gilboa. This view of Gilboa is from Beth Shan. 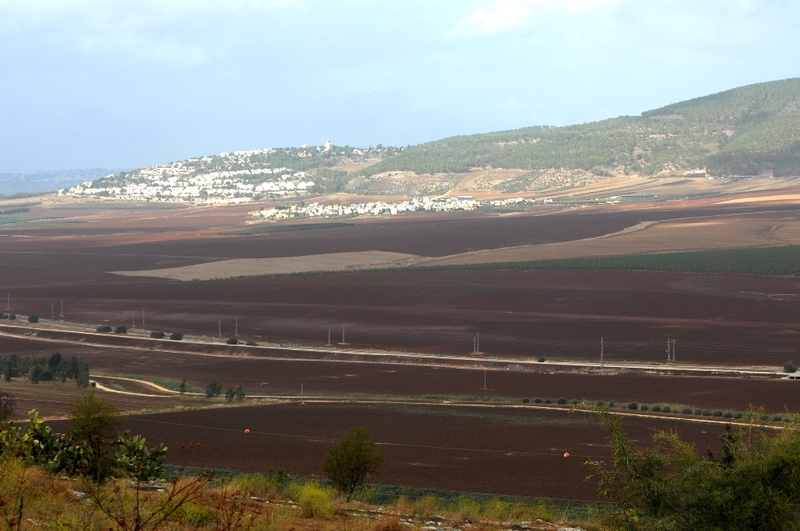 Gilboa as seen from Beth Shan. Photo by Leon Mauldin. As the 1 Samuel narrative continues, the next chapter states, ” Now the Philistines gathered together all their armies to Aphek, while the Israelites were camping by the spring which is in Jezreel” (29:1) We have previously posted photos/articles on Aphek here and here, where the Philistines at this time gathered all their armies. At Jezreel one can see the spring mentioned here in 1 Sam. 29:1. 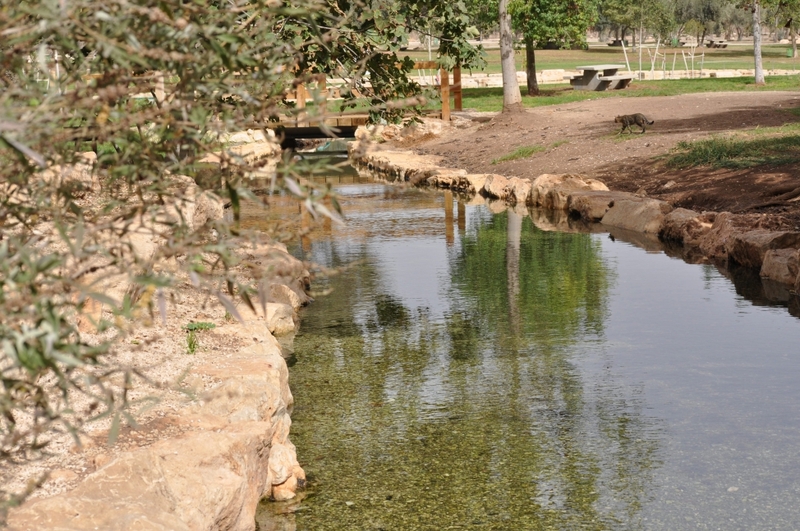 Jezreel Spring. 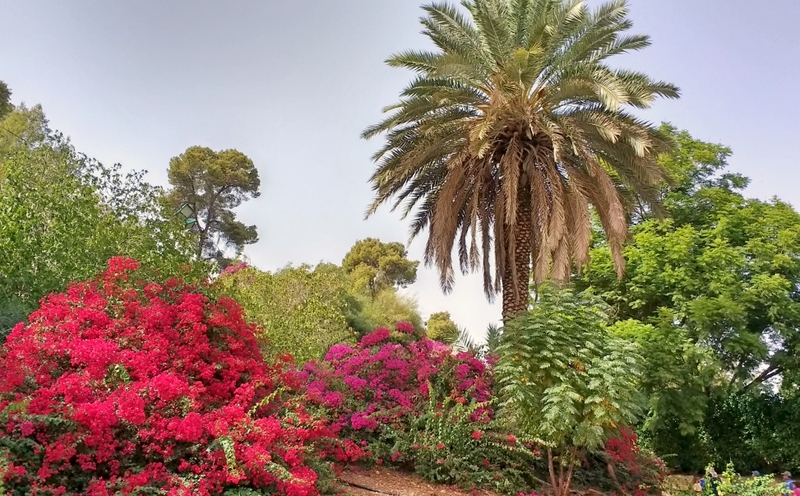 Note greenery at center. 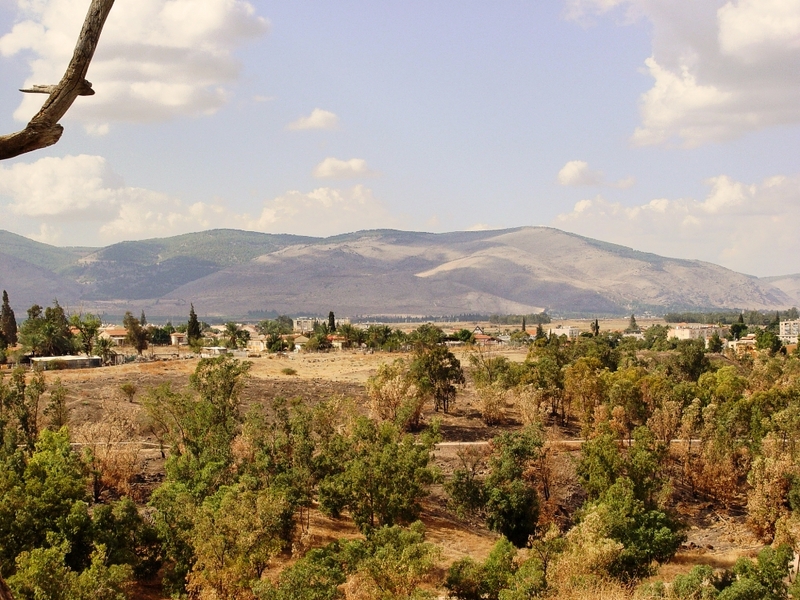 Tel Jezreel is in foreground. Photo by Leon Mauldin. 8 It came about on the next day when the Philistines came to strip the slain, that they found Saul and his three sons fallen on Mount Gilboa. 9 They cut off his head and stripped off his weapons, and sent them throughout the land of the Philistines, to carry the good news to the house of their idols and to the people. 10 They put his weapons in the temple of Ashtaroth, and they fastened his body to the wall of Beth-shan. (1 Sam. 31:8-10). 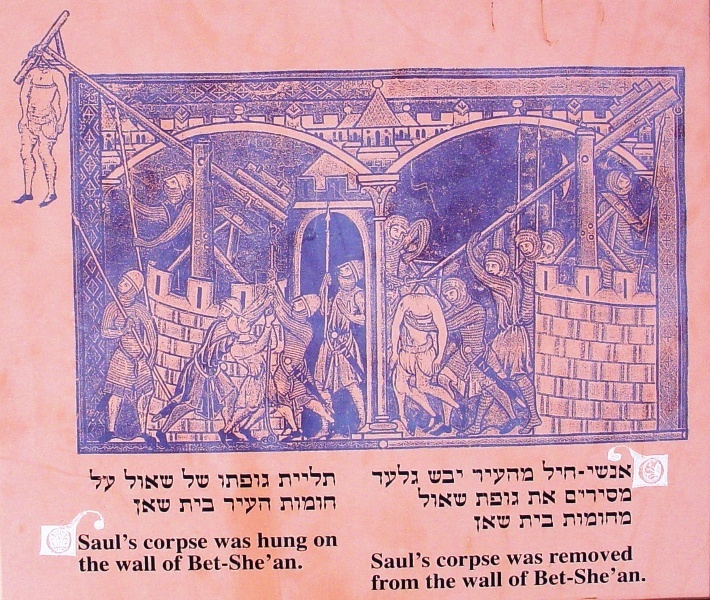 We are told that also the bodies of Saul’s sons were nailed to the walls of Beth Shan (1 Sam. 31:12). 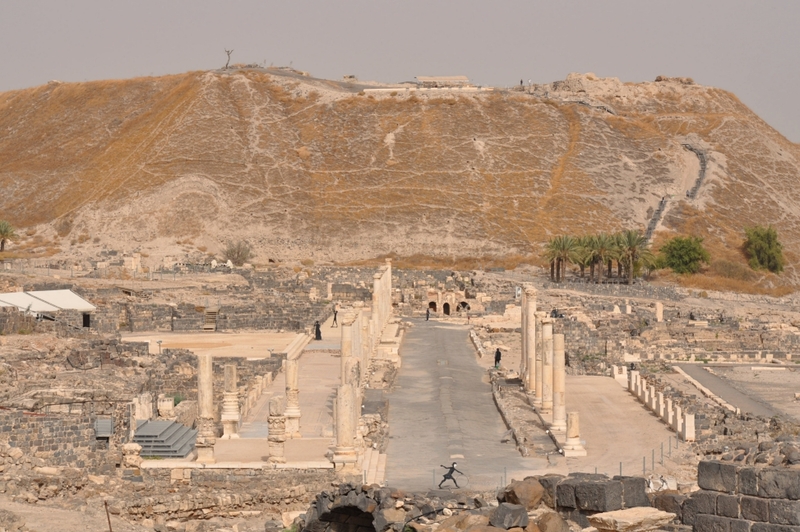 Beth Shan, where the Philistines nailed the bodies of Saul & sons. Photo by Leon Mauldin. These photos may be used along with maps to show where the events of 1 Sam. 28-31 transpired. Click on images for larger view. Our previous post looked at the implication of texts which name cities of the conquest which Israel did not conquer, or did not retain. As noted, Josh. 16:10 mentions Gezer in that context. The significance of this situation is two-fold. The continued presence of the Canaanites would turn out to be a detrimental influence on Israel, just as God through Moses warned. Israel would lapse into idolatry, worshiping the gods of the Canaanites, as well as those of the surrounding nations. Upon a closer look at the geography, it turns out that many of the places mentioned are not just random sites, but very strategic locations. Therefore it would greatly impact Israel in a negative way to not possess the specified cities. Beth-shean controlled major routes going both north-south and east-west. 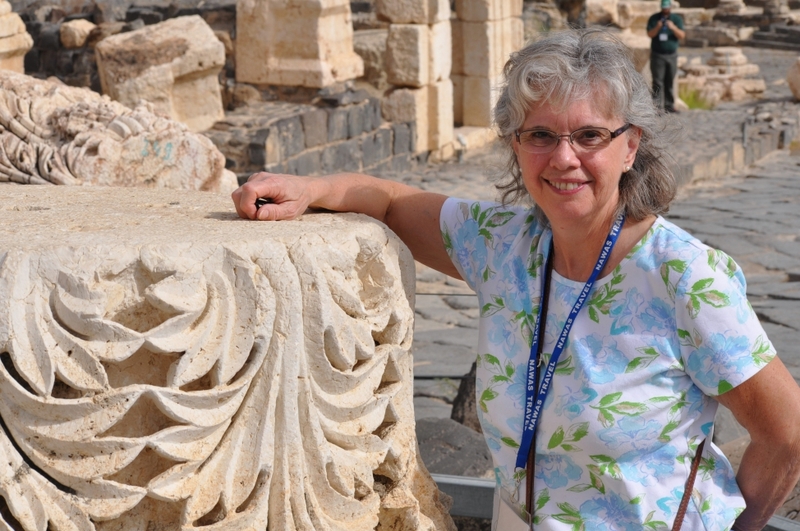 Beth Shean, allotted to Manasseh, but not retained. Photo by Leon Mauldin. 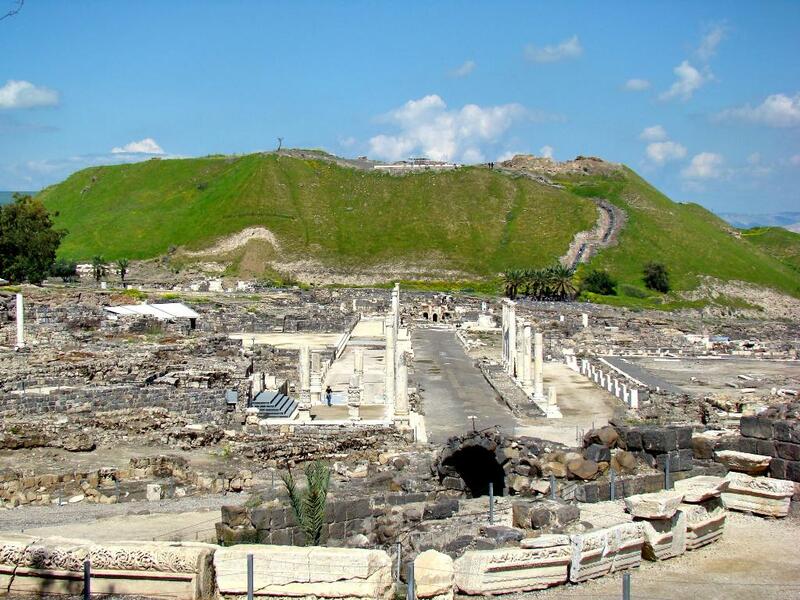 Beth-shean was strategically located at the juncture of the Jezreel and Jordan valleys. 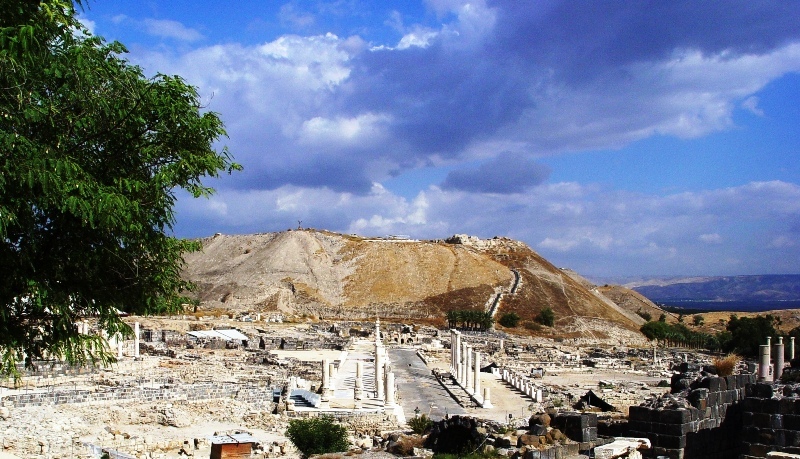 The modern name of the site is Tel el-Husn. Excavations at Tell el-Ḥuṣn, conducted from 1921 to 1933 by C. S. Fisher and A. Rowe for the University of Pennsylvania Museum, indicate that the site has been settled almost continuously since Chalcolithic times. In the Late Bronze Age the city apparently functioned as the major Egyptian center in Palestine. It is listed among those cities conquered by Pharaoh Thutmose III (fifteenth century B.C. ), and numerous Egyptian remains have been found. Included are a fourteenth-century temple to the local god Mekal, to whom was dedicated a stele inscribed with a prayer; a magnificent relief showing a lion and dog in combat was discovered on a wall of the temple. A victory stele of Seti I (1313–1292) indicates that he reinforced the city’s military operations, perhaps with troops from Gath-Carmel; another stele mentions the ˓Apiru of Yarmuth, probably the town assigned to Issachar (Josh. 19:21). Two temples, dedicated to Anat (called ˓Antit) and Dagon, were erected in the time of Rameses II and continued in use through the Philistine occupation and into the Israelite period; apparently these were the temples to which the Philistines fastened the armor and head of Saul (1 Sam. 31:10; 1 Chr. 10:10). A large cemetery north of the city has been assigned to this approximate period; it contains several anthropoid coffins (clay coffins bearing human portraits) of dignitaries or mercenaries in Egyptian service. 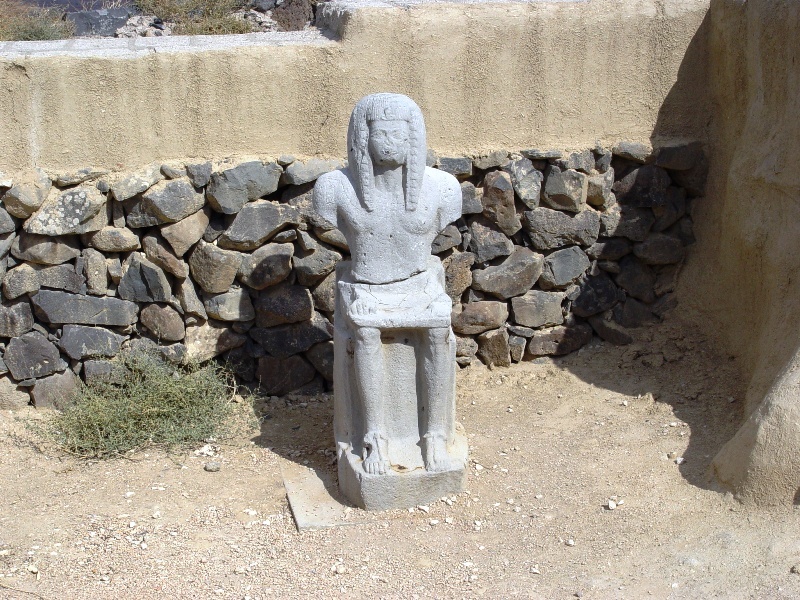 Remains of the Israelite occupation are unimpressive; the relevant strata of the tell bear considerable evidence of destruction by Pharaoh Shishak (ca. 920) and the Assyrians or Babylonians. 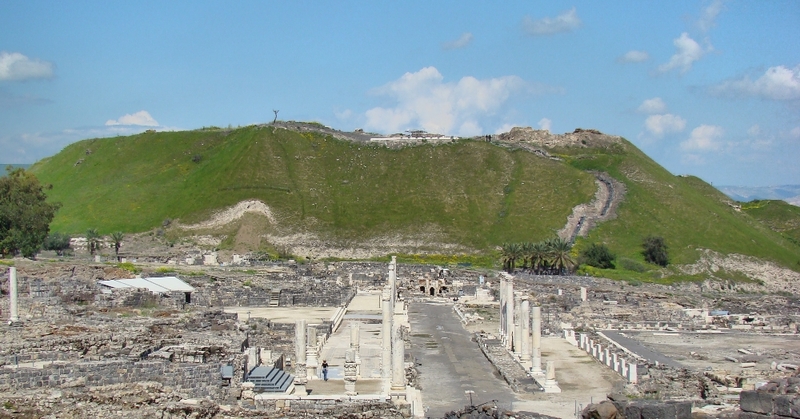 In the postexilic period Beth-shan was little more than a village. A theater, hippodrome, aqueduct, and a great city wall have been discovered, dating to the Roman occupation. Several churches and synagogues as well as a sixth century monastery survive from Byzantine times. 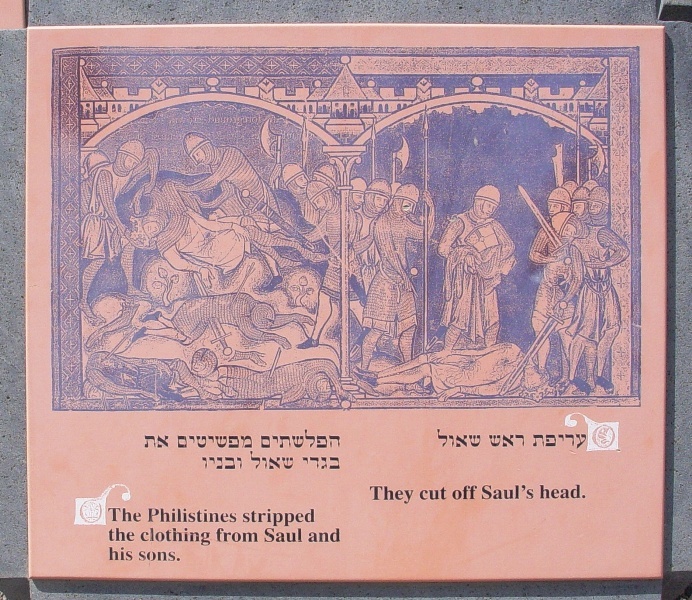 One of the sad things later associated with the site is that King Saul’s body, and those of three of his sons, were fasten to the walls of the city after Israel’s defeat by the Philistines (1 Sam. 31). By Helenistic times the city was called Scythopolis. By New Testament times it was included in the Decapolis, the “10 cities” given the right of self-government by the Romans. 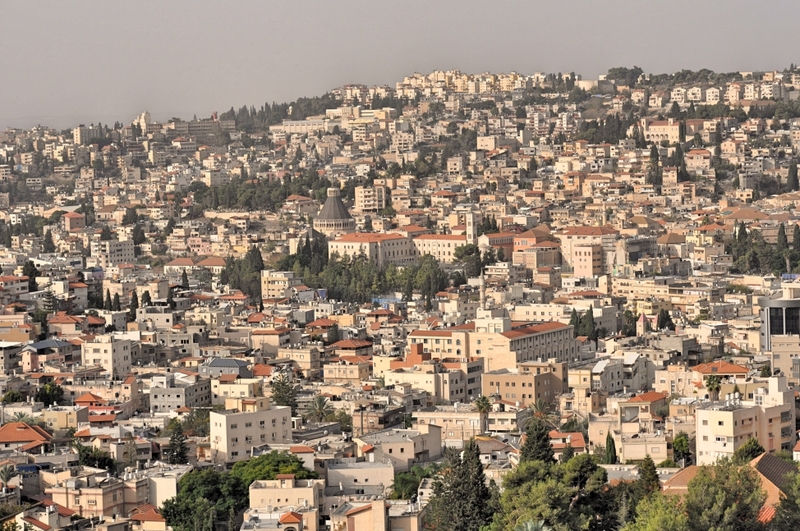 During Jesus’ Galilean Ministry, “And large crowds followed him from Galilee, the Decapolis, Jerusalem, Judea, and beyond the Jordan River” (Matt. 4:25, NET).